Gorgeous ribbed and ruffled, creamy blooms with pink edges and yellow-green throat. Awarded an AHS Honorable Mention. Daylilies (properly, Hemerocallis) are the plants every gardener dreams of. 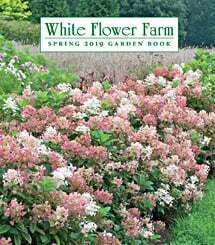 They offer glorious flowers in every shade except blue, a long season of bloom (though individual flowers last but a day), and a robust disposition that makes them easy to transplant, easy to maintain, quick to multiply, and resistant to pests. They make a carefree and colorful ground cover. For more information on growing Hemerocallis, click on Growing Guide. From the website photograph, I purchased Frosted Vintage Ruffles as it was gorgeous. Well, it's not - it is simply breathtaking! With over 50 types of Daylilies in my garden, FVR is my favorite thus far. I planted her at the beginning of the season in 2017 and patiently waited until this summer to view her first bloom. She seems so delicate but bravely survived our frost-laden winter of 2017-2018 which was colder than it's been in a long time. Her coloring just sings but in a gentle manner (think lullaby). The overlay of pink on the white petals is a treat for the eyes. Add this beyond special plant to your garden and gasp at the blossoms!